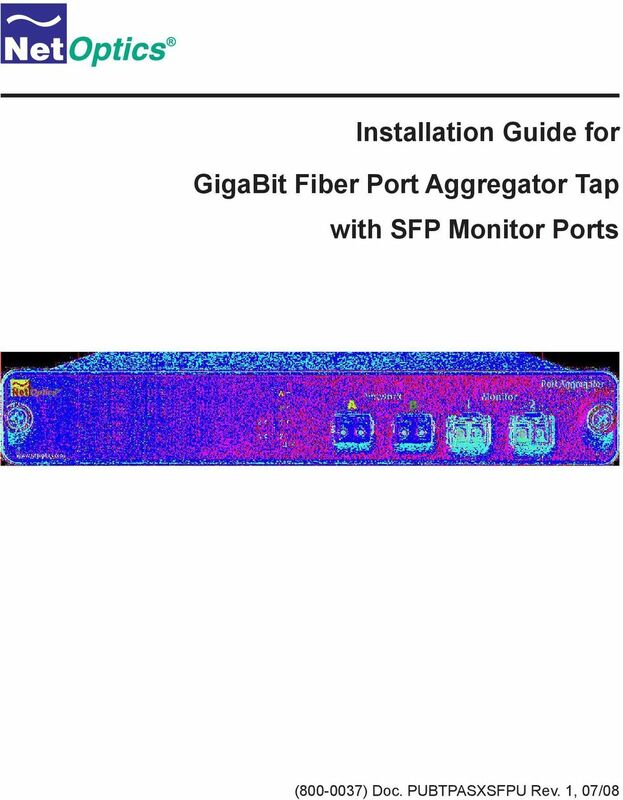 Download "Installation Guide for GigaBit Fiber Port Aggregator Tap with SFP Monitor Ports"
4 PLEASE READ THESE LEGAL NOTICES CAREFULLY. 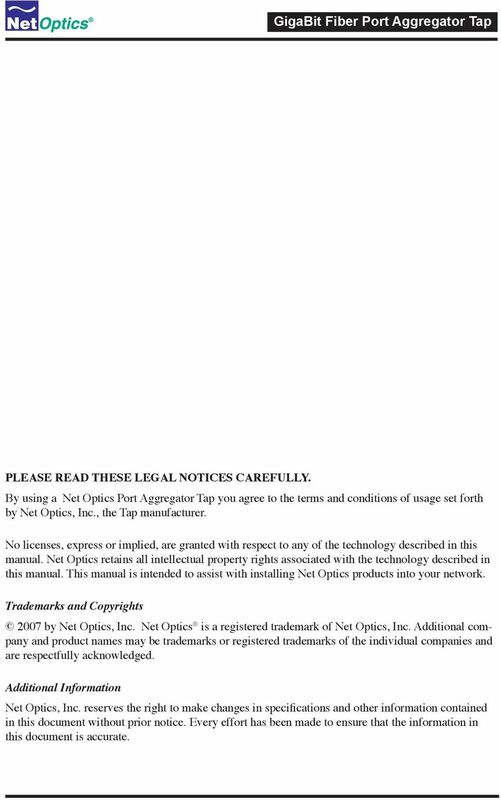 By using a Net Optics Port Aggregator Tap you agree to the terms and conditions of usage set forth by Net Optics, Inc., the Tap manufacturer. 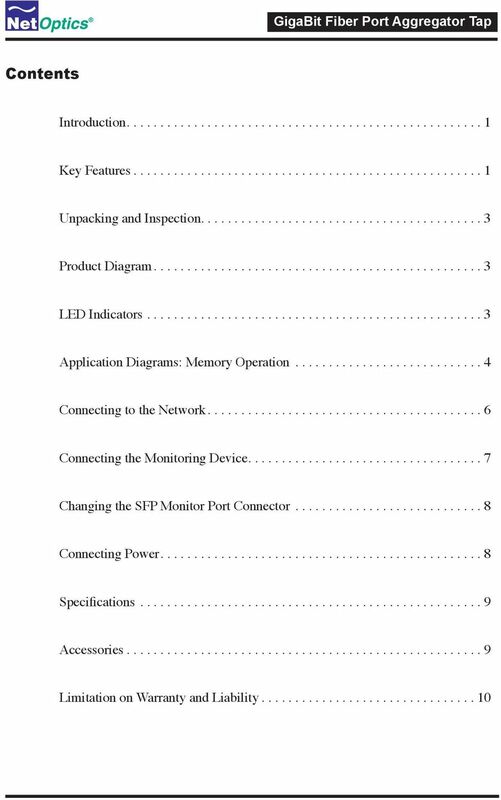 No licenses, express or implied, are granted with respect to any of the technology described in this manual. 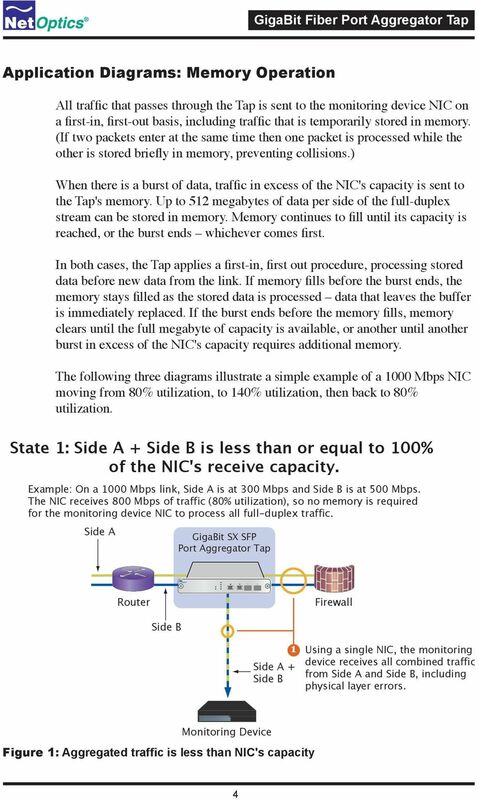 Net Optics retains all intellectual property rights associated with the technology described in this manual. 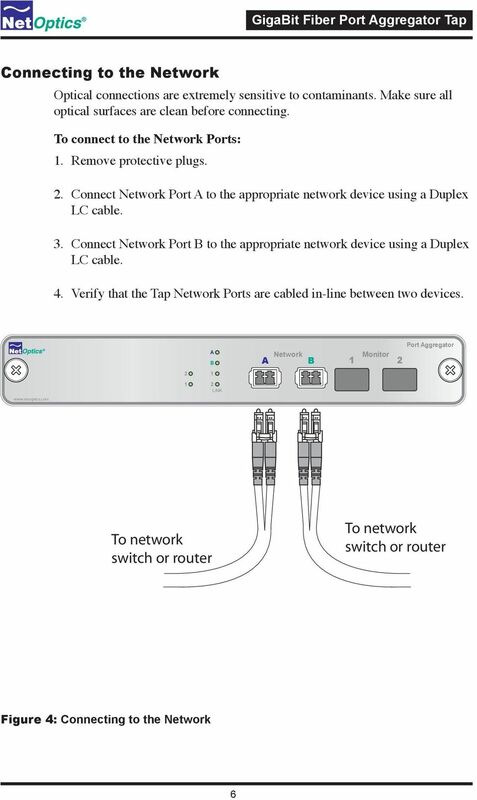 This manual is intended to assist with installing Net Optics products into your network. 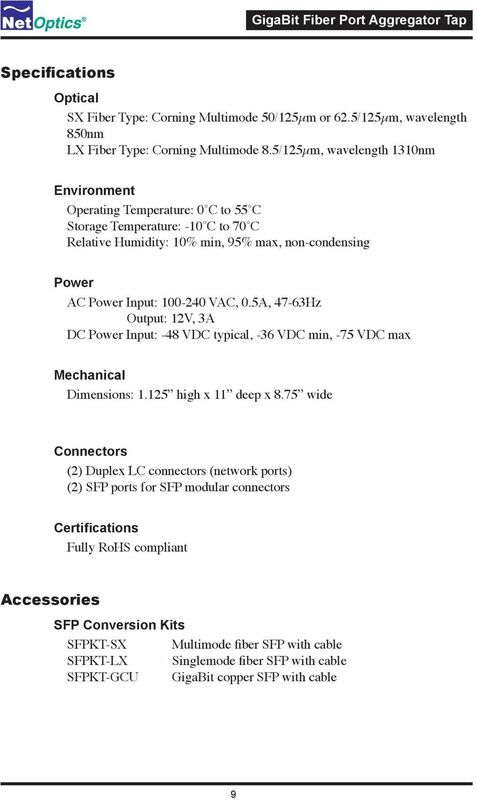 Trademarks and Copyrights 007 by Net Optics, Inc. Net Optics is a registered trademark of Net Optics, Inc. Additional company and product names may be trademarks or registered trademarks of the individual companies and are respectfully acknowledged. Additional Information Net Optics, Inc. reserves the right to make changes in specifications and other information contained in this document without prior notice. Every effort has been made to ensure that the information in this document is accurate. 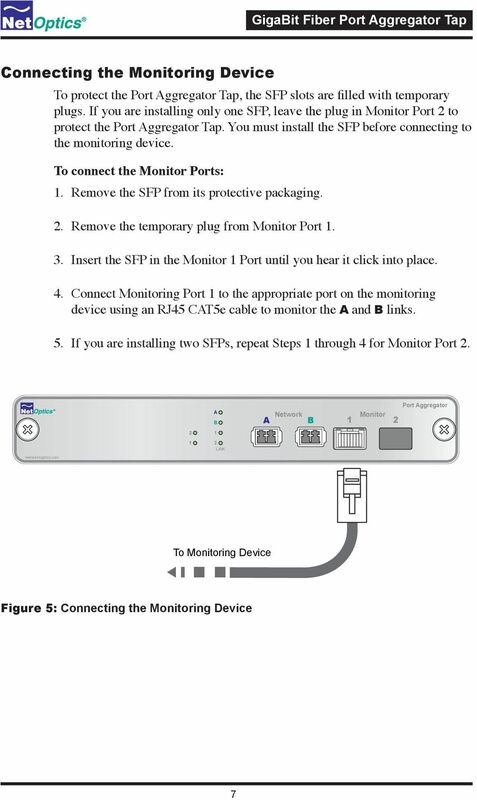 6 Passes all traffic (including errors) from all layers for comprehensive troubleshooting No IP address is needed for the Tap or monitoring device, enhancing monitoring security Redundant power ensures monitoring uptime Fully RoHS compliant Ease of Use LED indicators show redundant power, speed, link, and activity status Front-mounted connectors support easy installation and operation Silk-screened application diagram illustrates all connections for easy deployment Optional 9-inch rack frames hold up to two Taps Small form-factor pluggable (SFP) monitor port connectors increase monitoring options Available with -48 VDC power Tested and compatible with all major manufacturers monitoring devices, including protocol analyzers, probes, and intrusion detection/prevention systems Support Net Optics offers free technical support throughout the lifetime of your purchase (and has done so since our start in 996!). 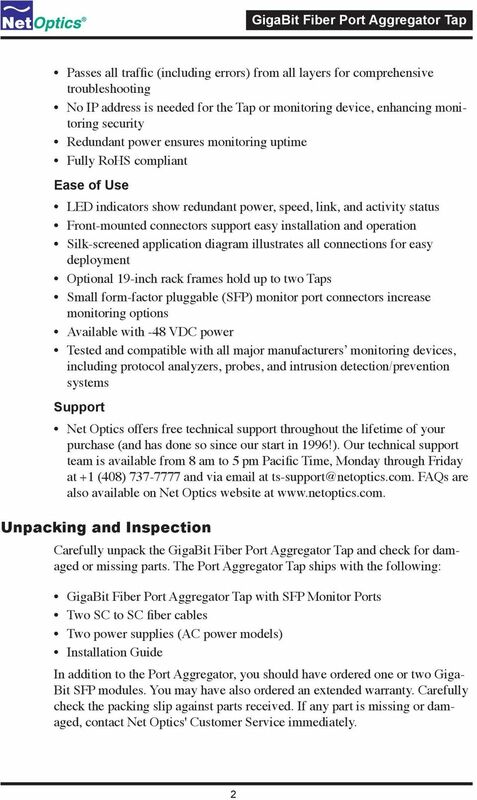 Our technical support team is available from 8 am to 5 pm Pacific Time, Monday through Friday at + (408) and via at FAQs are also available on Net Optics website at Unpacking and Inspection Carefully unpack the GigaBit Fiber Port Aggregator Tap and check for damaged or missing parts. 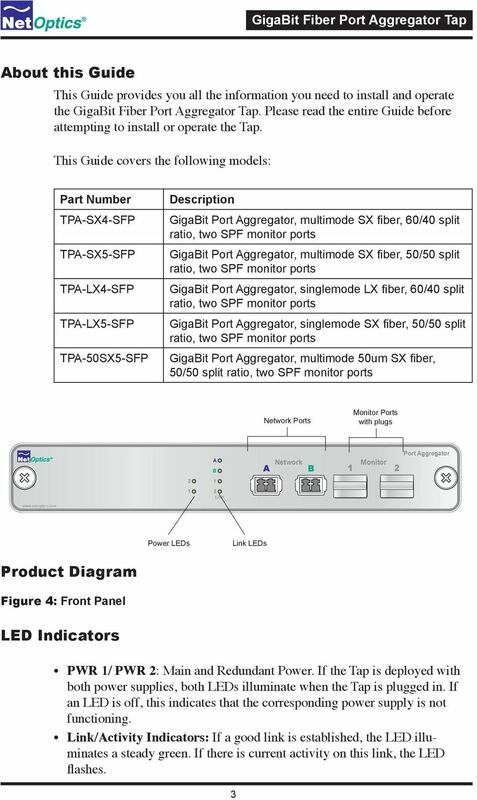 The Port Aggregator Tap ships with the following: GigaBit Fiber Port Aggregator Tap with SFP Monitor Ports Two SC to SC fiber cables Two power supplies (AC power models) Installation Guide In addition to the Port Aggregator, you should have ordered one or two Giga- Bit SFP modules. You may have also ordered an extended warranty. Carefully check the packing slip against parts received. 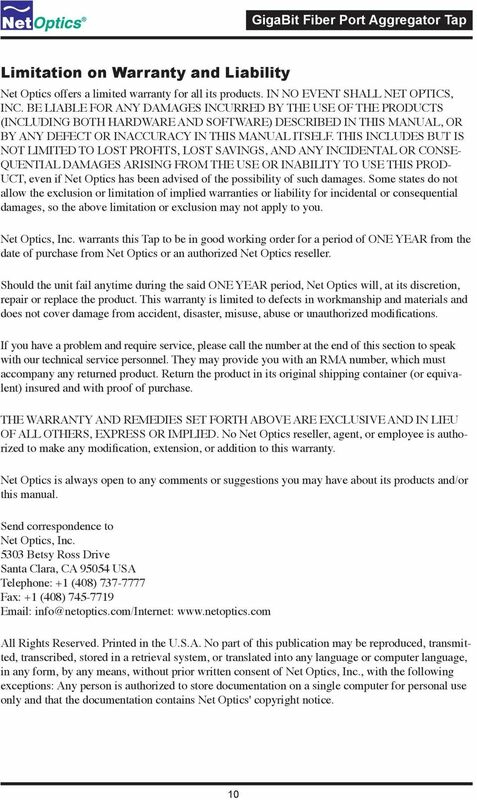 If any part is missing or damaged, contact Net Optics' Customer Service immediately. 16 008 by Net Optics, Inc. All Rights Reserved. 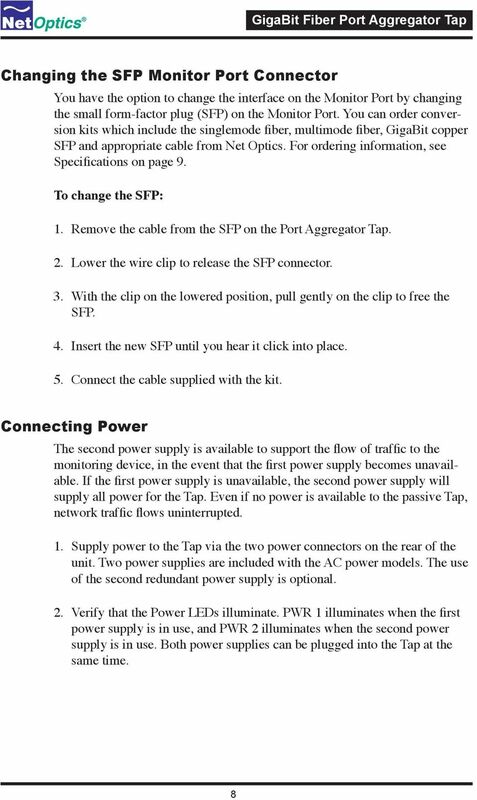 Installation Guide for. 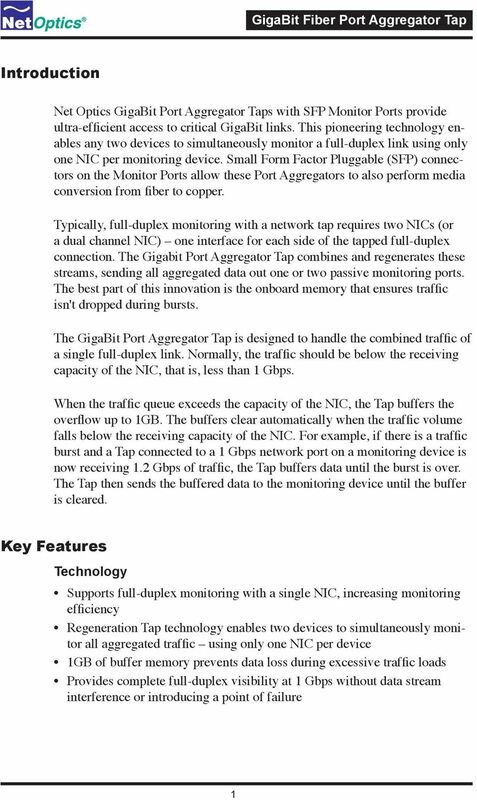 10/100BaseT Port Aggregator Tap with Active Response. Models PA-CU-AR, PAD-CU-AR. Doc. PUBPACUARU Rev. 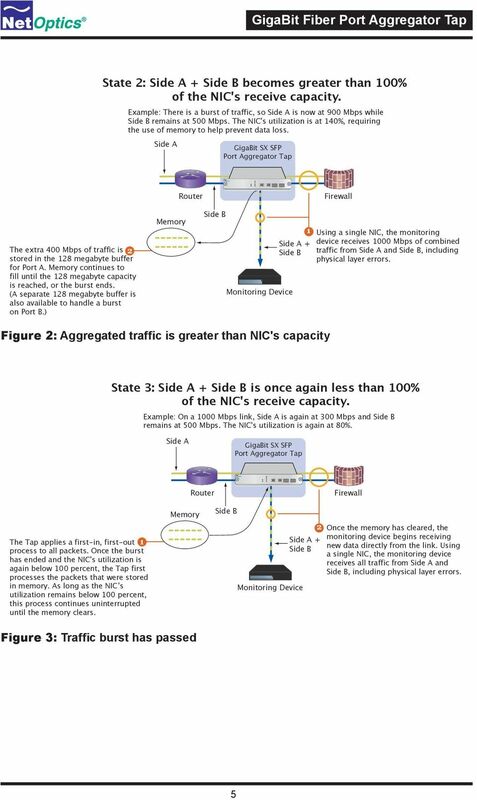 Protecting the Data That Drives Business SecureSphere Appliances Scalable. Reliable. Flexible. Imperva SecureSphere appliances provide superior performance and resiliency for demanding network environments. Abstract Organizations that rely on the reliability, security, and performance of their networks can no longer afford to wait for outages or security breaches to occur before installing test access points.